Marcy Rosen has established herself as one of the most important and respected artists of our day. Los Angeles Times music critic Herbert Glass has called her "one of the intimate art's abiding treasures." She has performed in recital and with orchestra throughout Canada, England, France, Japan, Italy, Switzerland, and all fifty of the United States. She made her concerto debut with the Philadelphia Orchestra at the age of eighteen and has since appeared with such noted orchestras as the Dallas Symphony, the Phoenix Symphony, the Caramoor Festival Orchestra, the Orpheus Chamber Orchestra in Carnegie Hall, the Jupiter Symphony and Concordia Chamber Orchestra at Alice Tully Hall, and the Tokyo Symphony at the famed Orchard Hall in Tokyo. In recital she has appeared in New York at such acclaimed venues as Carnegie Hall, the 92nd Street "Y" and Merkin Concert Hall; in Washington D.C. at the Kennedy Center, Dumbarton Oaks, the Phillips Collection and the Corcoran Gallery, where for many years she hosted a series entitled "Marcy Rosen and Friends." In recent seasons she has given Master Classes and appeared on stage in Beijing and Shanghai, China, the Seoul Arts Center in Korea and in Cartagena, Colombia. A consummate soloist, Ms. Rosen's superb musicianship is enhanced by her many chamber music activities. She has collaborated with the world's finest musicians including Leon Fleisher, Richard Goode, Andras Schiff, Peter Serkin, Mitsuko Uchida, Isaac Stern, Robert Mann, Sandor Vegh, Kim Kashkashian, Jessye Norman, Lucy Shelton, Charles Neidich and the Juilliard, Emerson, and Orion Quartets. She is a founding member of the ensemble La Fenice, a group comprised of Oboe, Piano and String Trio, as well as a founding member of the world renowned Mendelssohn String Quartet. With the Mendelssohn String Quartet she was Artist-in-Residence at the North Carolina School of the Arts and for nine years served as Blodgett-Artist-in Residence at Harvard University. The Quartet which disbanded in January of 2010, toured annually throughout the United States, Canada and Europe for 31 years. She performs regularly at festivals both here and abroad, including the Caramoor, Santa Fe, Ravinia, Saratoga and Bridgehampton Chamber Music Festivals, the Seattle International Music Festival, the Lockenhaus Kammermusikfest in Austria and the International Musicians Seminar in England. Since 1986 she has been Artistic Director of the Chesapeake Chamber Music Festival in Maryland and as a long time participant at the Marlboro Music Festival she has taken part in twenty-one of their "Musicians from Marlboro" tours and performed in concerts celebrating the 40th and 50th and 60th Anniversaries of the Festival. 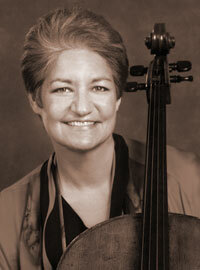 The recipient of many awards and prizes, Marcy Rosen twice won the Young Concert Artists International Auditions, in 1981 with the Mendelssohn String Quartet and again in 1986, as a soloist. She was further honored by YCA with the Walker Fund Prize and the Mortimer Levitt Career Development Award. She is also the winner of the Washington International Competition for Strings and was the first recipient of the Mischa Schneider Memorial Award from the Walter W. Naumburg Foundation. Marcy Rosen was born in Phoenix, Arizona and her teachers have included Gordon Epperson, Orlando Cole, Marcus Adeney, Felix Galimir, Karen Tuttle and Sandor Vegh. She is a graduate of the Curtis Institute of Music. Ms. Rosen is currently Professor of Cello at the Aaron Copland School of Music at Queens College and on the Faculty at the Mannes College of Music in New York City. She has also served on the faculties of the North Carolina School of the Arts, the Eastman School of Music, the New England Conservatory and the University of Delaware. Her performances can be heard on recordings from the BIS, Bridge. Deutsche Grammophon, Sony Classical, CBS Masterworks, Musical Heritage Society, Phillips, Nonesuch, Pro Arte, and Koch labels among others.